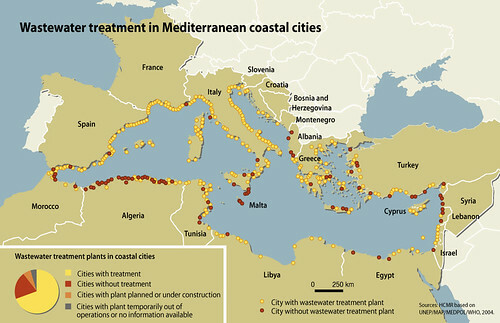 The distribution of coastal cities that either lack wastewater treatment facilities or have inadequate treatment facilities (defined as those removing less than 70 to 90 % of the Bio-chemical Oxygen Demand (BOD)) can be used as a proxy to identify areas where potentially deleterious amounts of organic matter are being added to the marine environment. Effective removal of pollutants from wastewater is achieved through secondary treatment that removes, through physical and biochemical processes, organic matter responsible for 70 to 90 % of the BOD. About half of organic-matter pollution from sewage originates from direct, untreated discharges, while less than one-third is in discharges of inadequately treated sewage. 63 % of coastal settlements with more than 2.000 inhabitants operate a wastewater treatment plant, while 37 % do not. 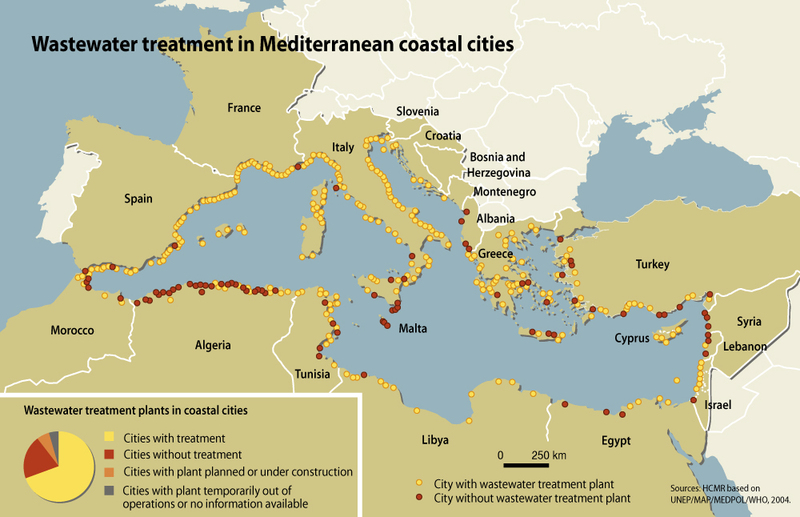 Secondary treatment is mostly used (67 %) in Mediterranean treatment plants, while 18 % of the plants have only primary treatment (UNEP/MAP/MED POL and WHO 2010). 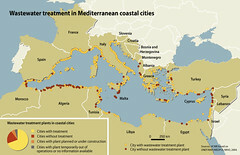 The distribution of treatment plants is not uniform across the Mediterranean region, with no sewage treatment in many cities on the southern shore of the Western Basin, in coastal Sicily, the Eastern coast of the Adriatic, the Aegean, and the northeastern corner of the Levantine Basin.